A day after new, puzzling questions arose over the latest Malaysia Airlines Flight MH370 possible debris discoveries, the government of Malaysia is now facing its own questions over how it is — or is not — handling those recently discovered fragments of what is believed to be wreckage of the mysterious, missing plane. The Malaysia Airlines Boeing 777-200 vanished more that two years ago, on March 8, 2014, and authorities believe that for some unknown reason, the plane with 239 passengers and crew on board flew off course for seven hours before crashing into the remote waters of the Indian Ocean — after cutting off all communications with the ground barely an hour into a routine overnight flight from Kuala Lumpur to Beijing. Despite a multi-national search effort costing over $100 million, not a single trace of the plane turned up until July 29, 2015, when a chunk of wing known as a “flaperon” washed up on a beach on the French-owned Reunion Island (see above photo). Malaysia Airlines Flight MH370: Wrong-Way Etihad Flight In January — Connection To MH370 Mystery? Two more pieces of what experts believe could be Malaysia Airlines Flight MH370 debris were discovered earlier this year, both by tourists, on beaches in Mozambique, a southeastern Africa coastal nation. But neither of those two possible fragments of the missing plane have yet been examined by authorities. 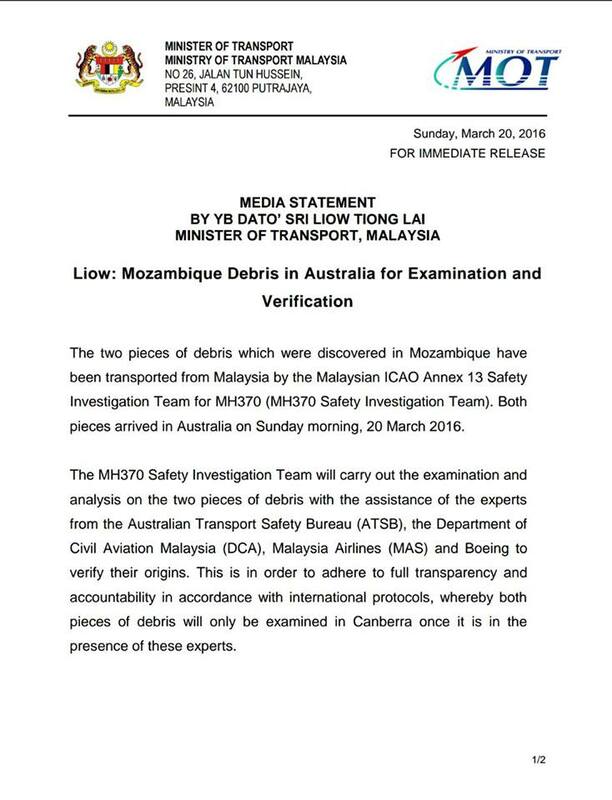 UPDATE, March 20: According to a press release issued Sunday by the Malaysia Ministry of Transport, the two pieces of Mozambique debris have been transported to Australia, and arrived there on Sunday morning, March 20. No timetable for examination of the possible Malaysia Airlines Flight MH370 debris by Australian authorities has been reported. The NBC News report in the below video contains more details on the Mozambique discoveries. Now experts who have followed the Flight MH370 case from the beginning want to know when those debris fragments will be examined by the Australian investigators in charge of the search effort — and why the Malaysian government seems to be simply sitting on them. Wise based his report on interviews with marine biologists who were stunned by the seeming lack of sea organism growth on the two debris pieces — growth that they said would have been clearly evident had the objects been in ocean water since March 8, 2014. So when will answers be forthcoming on the marine life evidence — or even on whether the debris was part of Malaysia Airlines Flight MH370 at all? That answer, like so much about the Flight MH370 case, remains unclear. 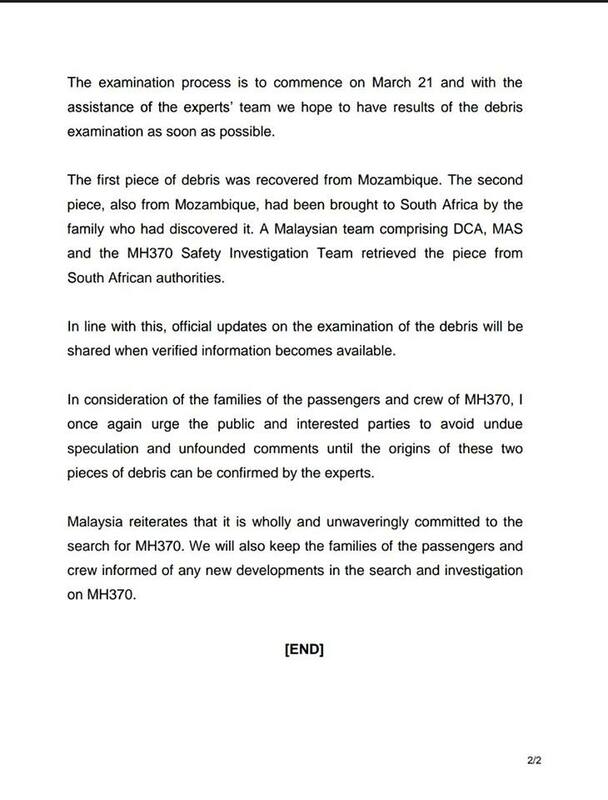 All that is known so far is that the two debris fragments, supposedly bound for Australia, were sent to Malaysia sometime around March 14 — and they remain with the Malaysia government days later. “So far as can be established, these two superficially surprisingly clean Mozambique fragments that were supposedly destined for examination in Australia by the Australian Transportation Safety Bureau, which is managing the sea floor search for MH370, are in Kuala Lumpur, in ‘safe keeping” pending examination,'” wrote aviation blogger Ben Sandilands on Saturday. A third piece of debris discovered earlier this year on Reunion Island was reported this week to have not originated from the missing Malaysia Airlines 777-200. But when Sandilands posed a question about the status of all the debris fragments to the ATSB, he received what seemed to be a contradictory response. When the Malaysian government plans to release its own findings about the two new debris fragments, or whether it even believes that they come from Malaysia Airlines Flight MH370, remains an unanswered question — adding yet another layer of confusion to what is already the most baffling mystery in aviation history.